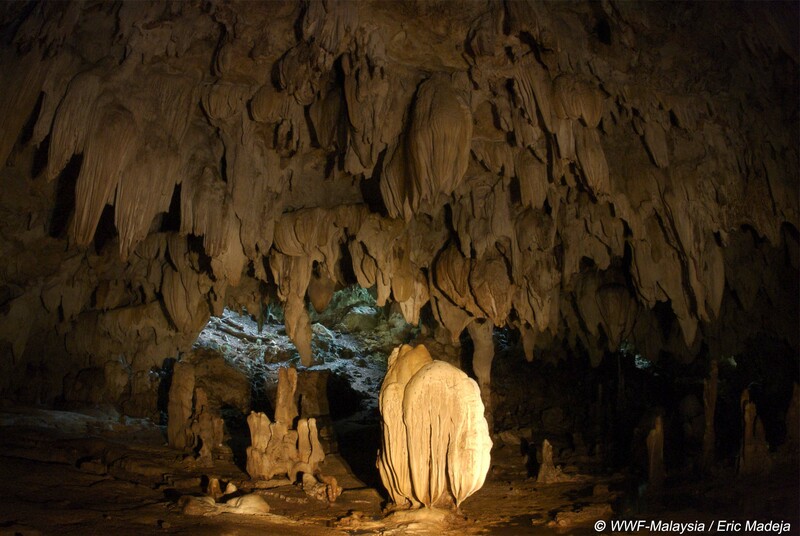 Interesting formations are a significant part of the caves located in Kuak Simpul on Balambangan Island. Kudat, Kota Kinabalu – Over 20 limestone caves exist on Balambangan Island, an island that is located in the proposed Tun Mustapha Park in the Kudat-Banggi area. With archaeological findings which date back to the Pleistocene (Pleisto - most; cene - recent) era (The Ice Age between 1.75 million to 11,000 years ago), and intriguing chambers and limestone formations, the caves have the potential to attract both local and foreign visitors to Kudat. This was stated by Mr. Ludi Apin, Park Manager of Sabah Parks, who gave a talk on Conservation Programmes in Sabah during the ‘Seminar on Conservation of Natural Resources’ in the Kudat Library last Saturday. The importance of the caves was highlighted during a recent familiarisation trip by Land & Survey Department Director Datuk Haji Osman Jamal. During the trip, led by WWF-Malaysia’s Chief Technical Officer Dr. Rahimatsah Amat and Sabah Parks Director Encik Paul Basintal, the beauty of the caves and its potential as an ecotourism site was discussed. Datuk Haji Osman Jamal pledged his support towards the gazetting of the proposed Tun Mustapha Park, which includes Balambangan Island. Artefacts estimated to be 16,000 years old which were found by researchers from the Malaysian Archaeological Research Centre (PPAM) of Universiti Sains Malaysia (USM) in August 1997 highlight the importance of Balambangan Island. The find included 3 prehistoric human bones and 36 items made out of animal bones believed to be tools used in the Pleistocene era. During the time of the find, PPAM Director, Datuk Dr. Siti Zuraina Abdul Majid, said the cave is the first historical site found in Sabah and can reveal information on the lives and cultures of the Palaeolithic communities who came into existence 20,000 years ago. During the seminar, talks were given by representatives from both government and non government agencies, including Mr. Chin Tet Foh (Fisheries Officer from Department of Fisheries), Dr. Nick Pilcher (Director of Marine Research Foundation), Mr. Simon Enderby (Director of Scubazoo), Ms. Lee Yoke Lee (Marine Biologist, WWF-Malaysia) and Mr. Richard Teo (Hotel Manager of Kudat Golf & Marina Resort). Dr. Annadel Cabanban, Manager of the Sulu-Sulawesi Marine Ecoregion Programme (WWF-Malaysia) said the coming together of representatives from these organisations is a milestone in the collaborative management of Sabah’s rich marine life. This is a positive step towards the successful management of the proposed Tun Mustapha Park, an area covering 1.1 million hectares. The seminar is one of the activities that was run as part of Kudat Environmental Week, jointly organised by WWF-Malaysia and Kudat Turtle Conservation Society (KTCS), supporting the national celebration of Malaysian Environment Week.